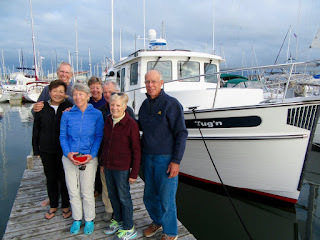 Friday July 8th, we raised anchor by 0600 for our 53 nautical mile cruise to Rimouski on the south shore of the St. Lawrence River. While overcast, drizzly and a little foggy with a dreaded north east wind against the ebb tide, thankfully the wind forecast was for only 10 to 15 knots, meaning the waves would not be too bad, making for an acceptable crossing. For this leg of the trip, we and Wings were joined by two other 37’ Nordic Tugs - Lee & Barb on “Encore” and John & Laura on “Mirto”. As soon as we left Tadoussac, we began to see beluga whales in groups of two or three. During the next hour, we saw about 15 whales as they congregate to feed at the confluence of the Saguenay and St. Lawrence rivers. Distance and timing made our attempts to photograph the beluga’s a failure, but watching them with binoculars presented us with a magnificent feast for the eyes. They are such a wonderful mammal to watch, but it is hard to find the right words to describe it. We certainly felt extremely fortunate and privileged to witness them in their home environment. As we got out into the St. Lawrence, we noted the air and water temperatures dropped to between 5 and 6 degrees celsius, so we had our cabin heater on full blast to keep our pilot house warm and cozy. As we made our diagonal crossing, the north shore gradually disappeared and eventually the south shore came into view. At this point, the St. Lawrence is about 20 miles wide and each mile you head down stream, the width grows quite quickly. Also, this area of the St. Lawrence marks the beginning of the formal shipping lanes out the rest of the river and into the Gulf of St. Lawrence and Atlantic. Fortunately, Wings, Encore and Mirto all have AIS (Automated Identification System) integrated into their electronics that allows them to see information (ship name, length, beam, speed, course) on other vessels equipped with AIS. As the large ships cruise along at speeds up to 20 knots, great care is needed in crossing the shipping lanes. Our timing was great as we crossed well ahead of the closest up bound and down bound ship traffic. Rimouski is a fishing port that shares its basin with recreational boats. Trucks on site were working with fishing trawlers to quickly handle their fresh catch. Unfortunately, this part of the harbour is not open to the public as we’d loved to have seen their operations. We enjoyed stretching our legs on an hour walk in the neighbouring area, while picking up a few groceries, followed by a great happy hour with the crews of Wings, Encore and Mirto. 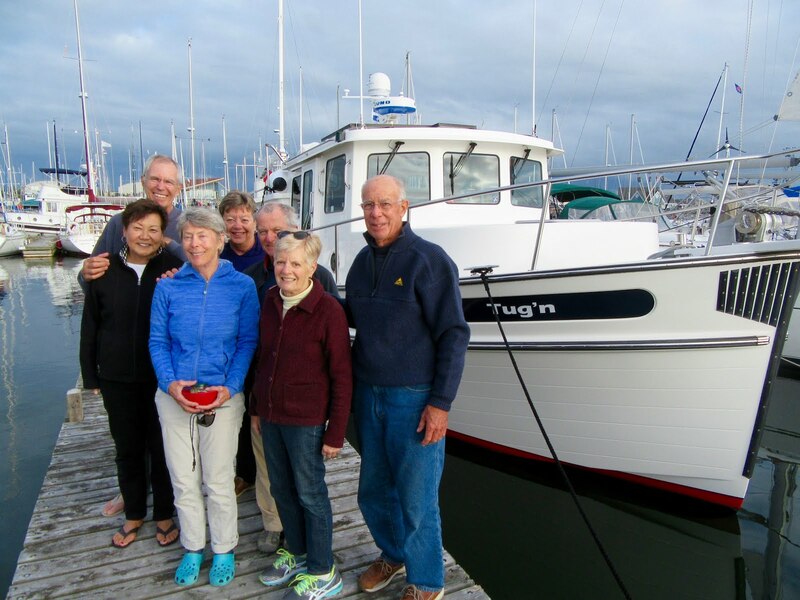 John and Laura are leaving their boat at Rimouski for two weeks while John returns to work at their home in Maine before continuing their journey. Hopefully we will meet up with them later on. There was one Quebec based tall ship in the port with a crew of about 15 young adults aboard, similar to Toronto’s “Pathfinder” brigantine program for youth. Unfortunately I missed taking a photo. An important marina/port service to recreational boats on the Great Lakes is getting regular pump outs. We are required to have a holding tank for our sewage and on the Great Lakes, all marinas have pump out services. After Quebec City, pump out services are few and far between. We are finding that even when a cruising guide says a marina offers pump outs, it is not always accurate. From talking with boaters from Maine and Rhode Island, it seems the east coast boaters in both Canada & the US face a similar lack of pump out facilities. My humble opinion is, if we are really serious about the health of our oceans and environment, this situation should be fixed. Rimouski as an example, has about 150 recreational boats plus its fishing fleet. With no pump out facility, they all follow the federal regulation (you must be 3 miles off shore) allowing them to pump their holding tank overboard. Bear in mind, those holding tanks also include chemical treatments to control the odour of its contents. The number of boats along our combined Canada & US coasts is staggering and I don’t understand why everyone seems comfortable with all this sewage being dumped in our oceans.Thanks for listening and if you are so inclined you can write your elected officials to tell them you are concerned. Ok, that’s enough of my lecturing for now. Our next port of call is Matane, Quebec. It has a rather shallow entrance to its marina and we’ve read you must enter at mid tide or above to have enough water. After studying the tide information and figuring out our cruising speed to time our arrival after 1530 hours, we determined we should depart Rimouski at 0900 hours. A light cloud cover and 10 knots of north east wind should make for a comfortable cruise. Cruising the south shore provides great views of the hilly shoreline and a steady stream of villages, each with one or more prominent, tin covered church steeples shining like a beacon. 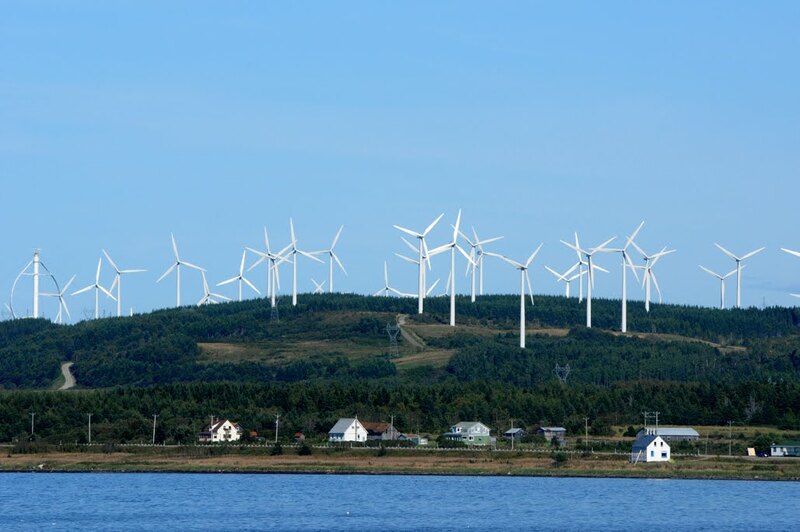 The shoreline is also home to enormous wind farms with their stately wind turbines reaching high into the sky and their blades seemingly turning slowly while automatically turning towards the wind from whatever direction it is coming from. Surprisingly, the tips of those blades are moving at about 90 miles per hour. 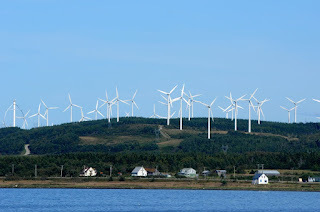 In one short look ashore I counted 150 wind turbines. Today, once again we were going east with an ebb tide and an opposing north east wind. We’d been told, if the north east wind is 15 knots or less, it will be fairly comfortable. Well, for about two hours the wind speed picked up to 15 - 17 knots and you could certainly feel the difference. The waves were steeper and very close together making for a tiring motion. The boats certainly handled the waves well and we made out fine, but were relieved when the wind reduced to 10 knots later in the afternoon. Wreck of the Empress of Ireland (a history story for this section of the St.Lawrence). 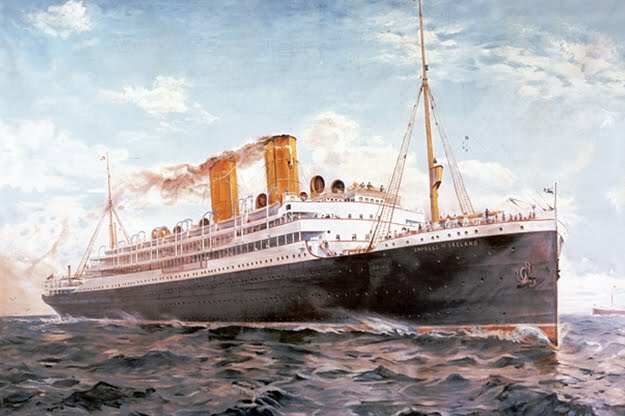 The Empress of Ireland was a 14,500 ton ocean-liner commissioned in 1906 for Canadian Pacific. She was 174 meters long and 20 meters wide and could cross the Atlantic in six days at a speed of almost 20 knots. Her four decks accommodated 1,550 passengers (300 first class, 450 second class and 800 in third class and steerage. On May 29, 1914 The empress had completed her exchanging of mailbags at Rimouski and was preparing for her 94th crossing. She dropped off her “pilot” (ships transiting the St. Lawrence are required to have a pilot to take control of their navigation) at Pointe-au-Pere station and they were gathering speed and heading for open water. Fog was exceptionally thick on the river. Shortly after 0130 the 3,500 ton Norwegian ship Storsand, caring a cargo of 11,000 tons of coal, heading upriver, rammed into the starboard side of the ocean liner at mid ship. The Storstad penetrated nearly 6 meters into the ocean-liner’s hull. The Empress’ skipper directed the captain of the Storstad (via megaphone) to go full ahead in hopes of keeping the huge hole plugged. Inevitably the two ships separated resulting in the ocean-liner taking on 270,000 litres of water per second. Though close to shore, beaching was impossible as the ship was inundated immediately. She listed sharply tipped over on her side and slipped below the cold water within 14 minutes. Dawn revealed the horrifying sight of hundreds of bodies stacked on wharves and beaches. The final death toll was 1,012 lives, many of which were never recovered from their watery grave. In a sense it was more horrifying than the sinking of the Titanic or the Lusitania because it happened in the middle of the night when most passengers were asleep giving them no opportunity for escape. The Empress of Ireland continues to hold the record for the largest number of passengers lost on a liner in peacetime. One lucky survivor of the sinking of the Empress of Ireland was a ships stoker named Taylor. He had also beat death aboard the Titanic. After the sinking of the Empress, Taylor then shipped out on the Lusitania, which as we all know was torpedoed off the Irish coast. Having survived all three major shipping disasters, Taylor gave up his seagoing career for other pursuits ashore. There is some debate as to the facts of this story, for which I am unable to fully confirm, but it sure sounded good. The town of Matane was given its name by Samuel de Champlain in 1603 and it quickly became a trading post for the exchange of European goods for furs with the Mi’kmaq First Nations people. Matane is known for its fish processing of shrimp, crab and salmon. When we arrived in Matane, it was almost 1600 hours on a Saturday afternoon. Fran, Jan and Barb all took off to a local fish market to see about buying some seafood. I was delighted to see Fran found some scallops, small shrimp and salmon sausages. We BBQ’d the sausages and had the shrimp on our salad. What a fine way to finish up another successful day on the mighty St. Lawrence River.